HCM City (VNA) – Global value chains (GVCs) development and cooperation, and promotion of small and medium-sized enterprises (SMEs)’ integration into GVCs have been high on agenda and supported by APEC member economies via a vast chain of initiatives and activities, heard a workshop in Ho Chi Minh City on August 26. The workshop on “Promoting SMEs’ Integration into GVCs in Services Industries-Logistics” aimed to help gain a deeper understanding of logistics as an important service industry, and SMEs’ participation in logistics as part of the GVCs in services industries. Luong Hoang Hai, Director General of the Multi-lateral Trade Policy Department under the Ministry of Industry and Trade, said that good logistics management, from the perspectives of governments and businesses would contribute to enhancing competitiveness and growth as well. Logistics involves a variety of areas such as sourcing procurement, order fulfillment, storage of raw materials, production planning, scheduling, controlling cost effective flow, assembly, packaging, maintenance, warehousing, distribution, finished goods and customers services, he said. Hai added that there is a huge room for SMEs’ involvement and their deep integration is inevitable. The workshop was expected to contribute to empowering policy makers and regional businesses to facilitate SMEs in logistics through sharing challenges, experience and best practices, making recommendations on strategies and policies to facilitate SMEs’ integration into logistics GVCs, and enhancing SMEs’ participation in logistics for their own sustainable development. 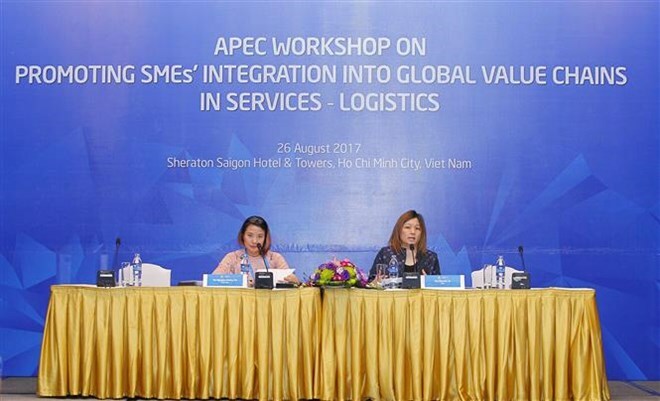 Tran Tri Dung, General Director of Logistics Knowledge Company Limited, told reporters that Vietnam has more than 3,000 logistics companies, of which up to 99 percent are micro, small- and medium-sized enterprises. There are a lot of enterprises in need of logistics but their mindset of these services remains ambiguous, Dung said.